There are numerous flavor wheels (also called aroma wheels and tasting wheels) created by the specialty foods industry. Industry professionals use them to understand the different flavors of the products they represent. The charts show the flavor spectrum in the particular category, mapping nuances of flavors and aromas. They’re a great way to learn how to taste. We’ve spent many enjoyable sessions, sitting down with the food and the wheel. We’ve also created our own Chocolate Tasting Chart. 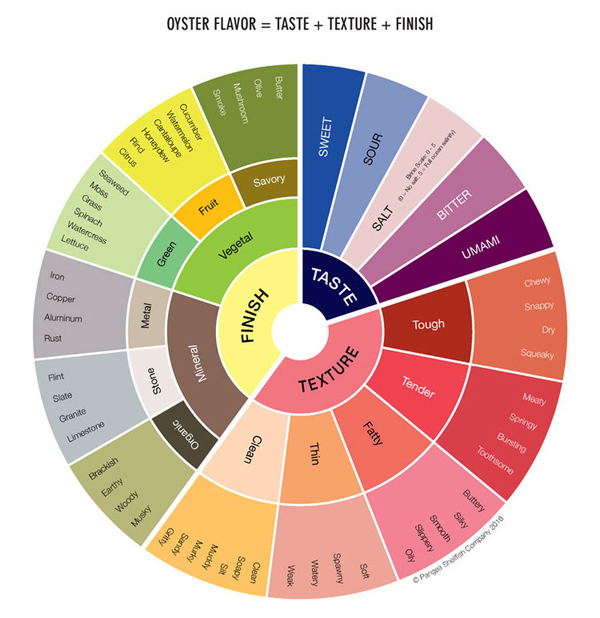 Today, we present an Oyster Flavor Wheel (below) created by Pangea Shellfish. The flavors of agricultural products like cacao beans, olives and wine grapes are greatly affected by their terroir, the unique components of the place (environment) where they are grown. For example, depending on where it is grown, Sauvignon Blanc can have grass or grapefruit notes—or neither. Terroir, pronounced tur-WAH is a French agricultural term referring to the unique set of environmental factors in a specific habitat, which affect a crop’s qualities. It includes the climate and microclimate, weather, elevation, proximity to a body of water, slant of the land, soil type and amount of sun. These environmental characteristics gives the wine its character. Terroir is the basis of the French A.O.C. (appellation d’origine contrôlée) system. 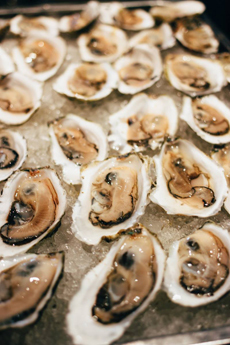 Oyster terroir includes the mineral components of the body of water (comparable to the soil components of land-grown products) and what type of food the water provides to the oyster; the temperature of the water; and seasonality, which includes both the temperature and spawning cycle. Top: Oysters On The Half Shell at Ox And Son | Santa Monica. Bottom: Permaquid oysters from JP Shellfish. Texture is a major component of an oyster’s flavor profile, so the wheel devotes a lot of space to it. 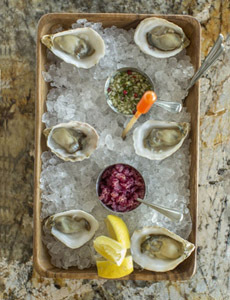 Texture, or mouthfeel, can vary widely among varieties due to the oyster’s species and growing method. These factors are why even oysters grown in the same region taste very different. For example, a Malaspina oyster from outside Vancouver Island tastes of artichoke with undertones of metal and salt. A Pemaquid oyster from Maine tastes of cucumber. In other product wheels the aromas, smelled before consuming the product, are emphasized in the wheel. But Pangea notes that it’s very hard to detect more than a refreshing ocean aroma in any fresh oyster. French oyster growers recently coined the term merroir to describe products harvested from the sea instead of the soil (marine + terroir = merroier). 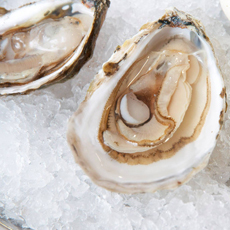 SEE THE DIFFERENT TYPES OF OYSTERS & OTHER OYSTER TERMINOLOGY IN OUR OYSTER GLOSSARY. 1. Start with the taste section. 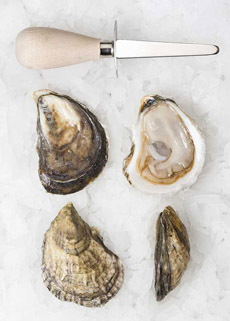 Be sure to note the oyster’s saltiness by using a brine scale of 0 to 5—0 being no salt, 5 being full ocean salinity. 2. Follow the wheel clockwise to note the oyster’s texture and finish. The finish is the taste that remains in your mouth after you’ve eaten the item. An oyster may have multiple attributes in each section, so taste for all the nuances. .
What If The Oyster Doesn’t Taste Great? If you encounter an unpleasant oyster, faults are built into the wheel. The wheel does not explicitly call out faults because it is subjective (an analogy: certain wine grapes have a quality described as “skunky” and some aromas are heavily sulphuric. Some people dislike them, others don’t care. Each taster should evaluate a product based on his/her own preferences. Forget the condiments: lemon, sauces, etc. They cover up the flavor of the oyster, and were needed in the days before refrigeration, to cover up any possible results of sitting in a warm place. Do not discard the oyster’s brine (also called liquor), the liquid in the shell. The brine is part of the tasting experience, and is essential to identify the salt content. Chew the oyster 3 to 4 times. Throwing back oyster shooters is fine when their freshness is past their prime, but should never be done with premium oysters. Otherwise, you completely miss evaluating the flavors, texture and finish. Have a palate cleanser between oysters. Water or seltzer (club soda contains salt) is a good option, but some people prefer water crackers like Carr’s. Unsalted matzoh does the same thing for a fraction of the price. This chart is © Pangea Shellfish Company, and is the first version of the wheel. It will continue to evolve based on input from industry professionals, so check for the latest version. Don’t want to shop and shuck at home? Bring the wheel with you to a top seafood restaurant and let the professionals do the work.